Get ready for an unforgettable experience in the Gandoca-Manzanillo Refuge! While you walk into the forest, you will see a variety of exotic vegetation. Most of the trees are covered with mosses, lichens, bromeliads, orchids and other plants. Many cascade from the branches of these gigantic trees creating a backdrop for life in the jungle. We will spot many different species of birds! There are 384 species we have in this area. 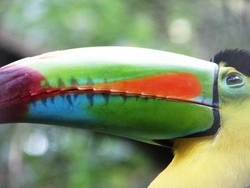 Some examples are hummingbirds, tanagers, owls, and toucans. Our professional naturalist tour guides will use their sharp senses to spot animals. 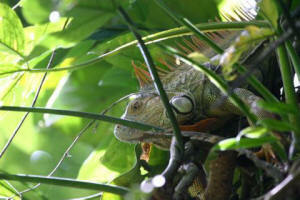 We commonly see white-faced monkeys and howler monkeys, sloths, iguanas, snakes and poisonous frogs. 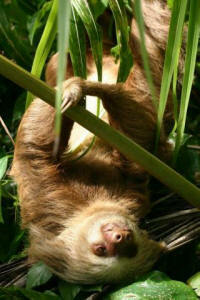 There are numerous other different types of animals that you will be able to observe in this tour. You will also learn about medicinal plants and the natural history of this natural paradise. Then, you will have the opportunity to learn interesting facts about our Afro-Caribbean customs. We have guides available who speak English, Spanish, French and German. Please include in your request if you would like a French or German speaking guide. See you in the Gandoca-Manzanillo Refuge! Includes: Rainforest hike with professional naturist guide. Not included: Meal at Maxi’s restaurant. What to bring: Jungle: hiking shoes, light cotton clothes, long pants, insect repellent, binoculars and water. Beach: towel, sun block, some cash for food and drinks.